I went to the Co Op today to buy my flea control products and found a new product called FiproGuard PLUS. It costs about half as much as the other flea control medications, so I wanted to give it a try. 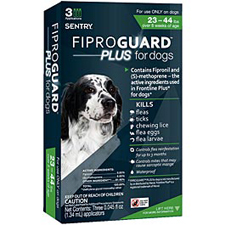 FiproGuard PLUS comes in a liquid form that is applied directly to the dogs skin, usually between the shoulder blades, and lasts about 30 days. It kills fleas, ticks, chewing lice, flea eggs, and flea larva. For dogs and puppies over 8 weeks old. The active ingredients in FiproGuard PLUS are fipromil and (S)-methoprene, also the active ingredients used in Frontline Plus. I bought some today and it has been effective on my dog.